Sail Far Live Free - Relent to Water Wanderlust! : Blue Island Jacket Packet? The racer-cruiser concept has been around since the early 1960's (see Ted Brewer's 50 Years of Cruising Sailboat Evolution). Today's examples seem less of a compromise and are able to offer excellent cruising accommodations while still being competitive on the race circuit. But compromises still exist, nonetheless. Now there's a new kid coming to the racer-cruiser neighborhood and I'm intrigued because the project collaborators are two designers who have produced several models that fill my cruising spirit with envy. Island Packet's founder and current CEO/Chief Designer, Bob Johnson, has teamed with his old buddy Tim Jacket, ex-President and Chief Designer at Tartan and C&C, to begin producing a "performance cruiser" called the Blue Jacket 40. The BJ40 is planned to be the first in a series of boats to come out of this collaboration. They'll be built at Island Packet's facilities and are said to be a melding of Bob's cruising design expertise and Tim's performance prowess. Looking at the Blue Jacket 40, I can clearly see the performance features (twin wheels, deep bulb keel, spade rudder, plumb bow) but the coach house and overall look from the deck up give away the Island Packet connection. The cabin itself seems very cruiser-friendly and the Solent (twin headsail) rig and self-tacking Hoyt jib boom are definitely nice features for long passages. Still, if given the choice, I'll take an Island Packet Estero. Or better yet, an IP485. If you're reading this Bob, how about making me a steal of a deal on an Estero demo boat? In all seriousness, all of these boats are out of my price range, but I'm interested to see if any of the modern features in the Blue Jacket's design eventually find their way into Island Packet's lineup. Bob has been a staunch promoter of IP's "full foil keel" design for years, but will he adapt this based Blue Jacket success? What about the infused composite hulls and decks on the Blue Jackets? Will they become unseen "upgrades" to the IP line? Blue Jacket 40 - See the Island Packet influence? I spoke with Bill Bolin, VP of Sales & Marketing at Island Packet, and was given permission to share an interesting interview with Bob and Tim that first appeared on the new Blue Jacket website. Have a read for yourself and see if you think this new design and unique collaboration will add anything to the well-seasoned racer-cruiser formula. Q: Tell us about the inspiration behind creating the new Blue Jacket line? A: (BJ) For some time now Island Packet has been considering adding a line of performance-oriented cruising sailboats to expand our market. Tim and I have had a long friendship and a respect for each other’s work, so when I heard that Tim had established a new independent design office we contacted him to explore the possibility of working together on this new venture. A: (TJ) Bob and I have admired each other’s work for many years so when he first reached out to me about this project I quickly realized what a great opportunity it would be to work together on a new boat line with him and the Island Packet team. Q: Two of the industry’s better known and most experienced “Chief Designers” working together has the potential for conflict and compromise . . . how is this working out? A: (BJ) Let me make it clear that the Blue Jacket is Tim’s design with my collaboration. We are enjoying working together and are both learning from each other’s experience, which I feel has tangibly benefited the creative process for this new yacht. I think it’s the proverbial “win-win” arrangement, largely facilitated by our compatible personalities. A: (TJ) Bob and I both have years of experience in materials and manufacturing technologies, yacht design, and corporate management that puts us in a uniquely qualified position within our industry. The new Blue Jacket series will reflect the benefit of our combining this depth and scope of experience. 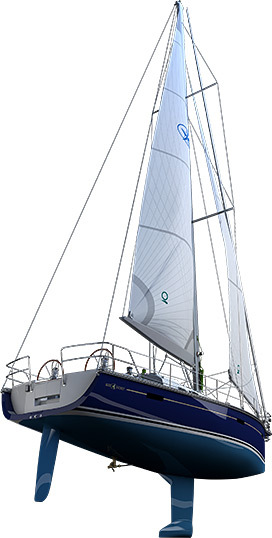 Q: The Blue Jacket 40 is described as the first in series of planned designs. What do you envision down the road? A: (TJ) We are considering at least two additional models. While we have some ideas regarding these, we’re not ready to share anything yet. A: (BJ) I also think we will gain a lot of insight on how to evolve the designs both from owner feedback and the expansion of our new Blue Jacket dealer network in the US and abroad. Q: This sounds like you’re planning for both a US and export market? A: (BJ) Yes. Island Packet’s export market historically represents over a third of our total sales. Our plan will be to design and build the Blue Jacket series to meet or exceed all ABYC domestic standards as well as the ISO/CE standards in place for export yachts. Island Packet was the first US sailboat builder to become CE certified back in 1992 when the standards first took effect, and we plan to continue supporting this third-party validation for compliance with all design and construction standards. Q: Where will the Blue Jackets be built? A (BJ): Our Largo, Florida facility will be headquarters for the actual boat construction, utilizing our Island Packet manufacturing team. This will ensure the same quality, customer support and corporate culture that have made Island Packet Yachts one of the world’s most respected yacht builders. Sales and marketing responsibilities for the Blue Jacket will also come from our Largo offices, assuring consistent messaging and a level of dealer involvement and support that has become renown in the industry. A: (TJ) The tooling is being done at both my Ohio facility and at the Island Packet plant. I am rapidly assimilating many of Island Packet’s preferred manufacturing methods and melding these with my own experiences for what we think will be a great new product. With Bob and I each having many decades of building experience, our shared efforts in this respect are producing a “best practices” solution that will benefit all parties and the yacht. Q: Bob, given Island Packet’s successful 33 year track record with over 2,500 yachts built and sailing in all corners of the world, how do you see the Island Packet line evolving, and what impact might the Blue Jacket series have on future Island Packets? A: (BJ) Wow…give me a crystal ball! I guess I’d respond by first saying the “design brief” for Island Packet will almost certainly remain unchanged, with its focus continuing to be on seakeeping, safety, livability and ease of handling for a cruising couple. Different manufacturing technologies (infused composite hulls and decks, carbon fiber components, etc.) introduced with the Blue Jacket line may eventually find their way into Island Packet construction if deemed appropriate, but the two product lines address different market segments with different sets of priorities. Q: Where does the name “Blue Jacket” come from? A: (TJ) Well, while it has an obvious connection with my last name and Bob’s initials, “Blue Jacket” has historical connections in the sailing world. First, for centuries the name has been a reference to both US and British sailors. The extreme US clipper ship “Blue Jacket” was also named for this reference, complete with a figurehead of sailor in a blue jacket. This clipper ship was known for her speed and luxury, features that will be associated with our own Blue Jackets. A: (BJ) I’ll add that the clipper “Blue Jacket” was also part of a fleet of well known “packet ships” providing fast and comfortable passenger service in the days of large sailing ships, part of the inspiration for our Island Packet name as well. (the White Star line) were well known for their “impeccable level of customer care”, something Island Packet is certainly highly regarded for and will bring to the table with the new Blue Jacket line. Q: How would each of you then summarize your decision to create the new Blue Jacket line? A: (TJ) Bob and his team have successfully built a strong and loyal following for the Island Packet brand over the last 33 years, building yachts noted for many superlative qualities, not the least of which is exceptional and consistent build quality. In my work with Tartan and C&C, I’ve also been responsible for the design and construction of over 2,500 yachts; between the two of us that’s more than 5,000 yachts worth of experience! 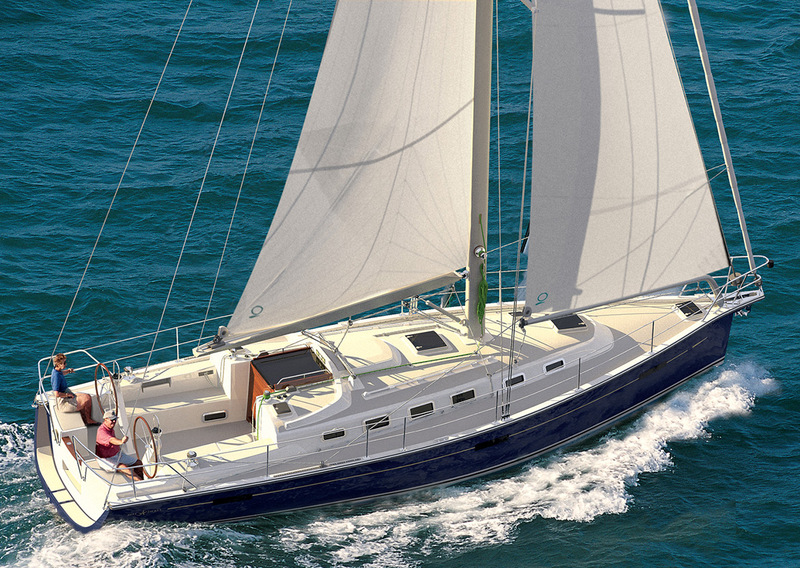 The Blue Jacket series will greatly benefit from Island Packet’s stellar corporate culture and capabilities and will give sailors looking for a contemporary performance cruiser a great new choice. A: (BJ) Not only does Island Packet bring a wealth of manufacturing experience to the table, but also a history of designs that have been recognized with numerous industry awards for being the best for their intended purpose, for their innovation and for their value. Tim’s designs for Tartan and C&C have also garnered an equally large number of similar awards, with 15 Boat of the Year Awards alone between the two of us. This combination of proven talent and experience will produce a formidable new choice in the performance cruising yacht market.